It’s that time of year again, the winds start to pick up, the leaves are turning, and you can feel the seasonal shift towards winter. 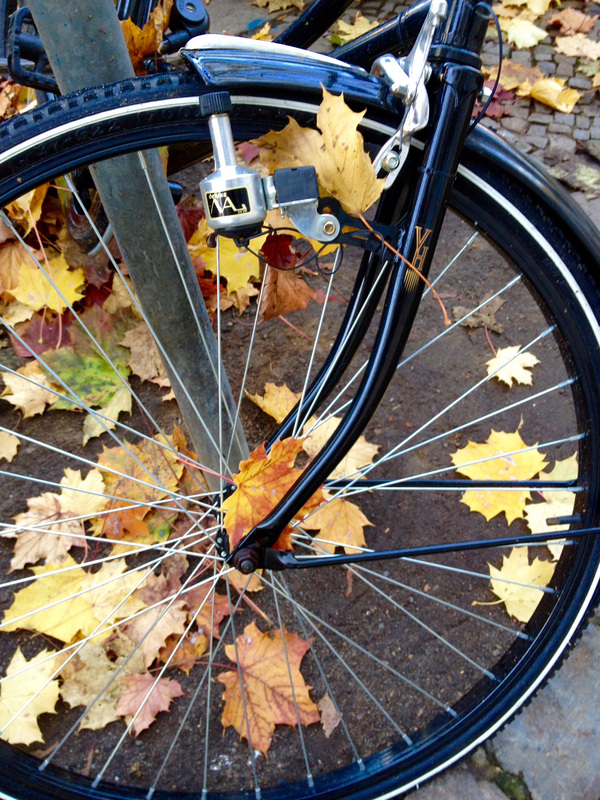 While there might be a chill in the air, this doesn’t mean you need to put your bike away. The trick is to be prepared, and to do a few simple bits of bike maintenance to keep you rolling comfortably and efficiently. Check your tire pressure as the temperature drops. As the temperature drops, so will your tire pressure. Check and top up your tires more often. Seat height: be good to your knees and bits – your seat may have shifted so it’s a good time to make sure it’s at the right height and position. Shorter daylight hours and grey, rainy weather means having lights at full strength are essential. Check your batteries to make sure your lights shine bright. Consider installing dynamo lights for added convenience & reliability. Wipe and re-lubricate your chain to help protect it from rain/rust. Consider adding some mud guards if you don’t already have them — and not just the clip-on ones that are easily stolen. Keep a scarf, hat, gloves and an extra top layer in your bag as front-line protection against unexpected chilly fall winds. 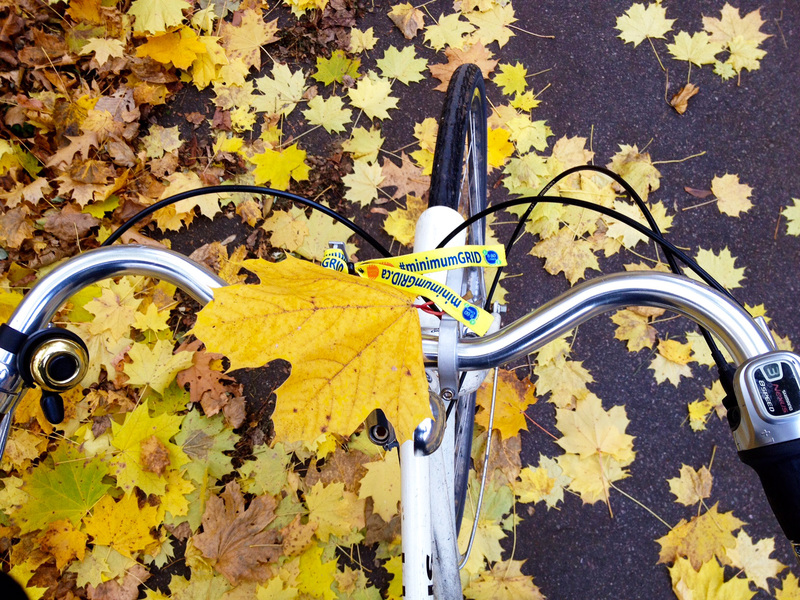 Fall riding is comfortable with the right accessories. A rain poncho and waterproof pannier are totally worth the investment. Make sure you bring them along if there’s even a chance of rain. Don’t get cocky: You’ve been riding all summer, but stay sharp and alert. Dusk coming sooner makes you harder for other road users to see during the busy evening rush hour. Also, in early fall the sun ends up in westbound drivers’/riders’ eyes during evening rush hour. Ride predictably, signal your intentions, make eye contact when possible, and use extra caution. Rainy windshields combined with earlier darkness make bicyclists and pedestrians even harder to see. Wearing lighter-coloured clothing, a reflective safety vest, sash or clothing, and always using lights will keep you visible. 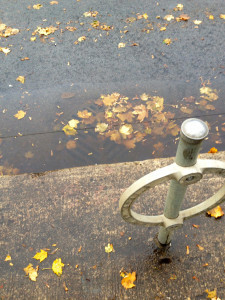 Avoid puddles and piles of wet leaves. 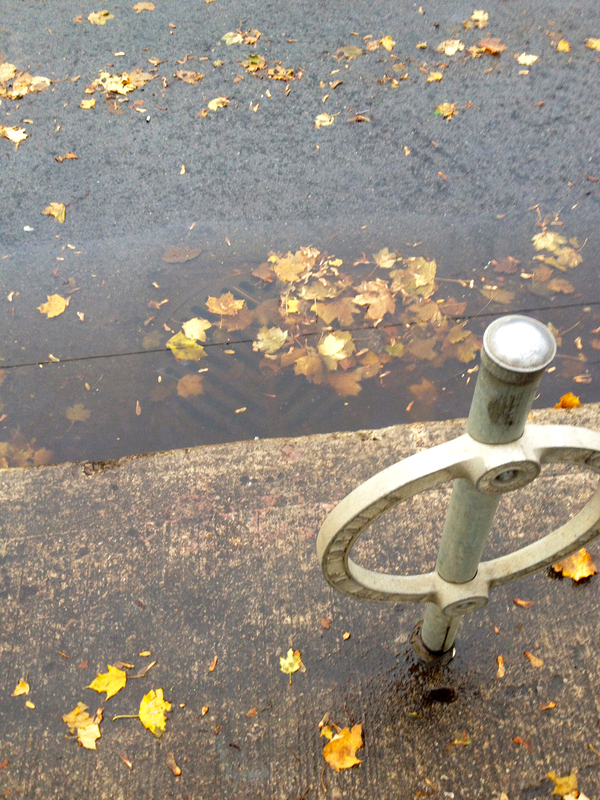 Piles of leaves are slippery when wet, and you never know what’s underneath them. Avoid them when possible, and use extra care at reduced speed if turning on them. Wet streetcar tracks can bite. Cross them carefully at a right angle when possible and don’t lean into a turn since wheels can slip. If you’re not already in the habit, shift into lower gears when you slow or stop to be kind to colder muscles as you get moving again. Cover your mouth with a scarf to help protect your lungs from the burn of colder air. 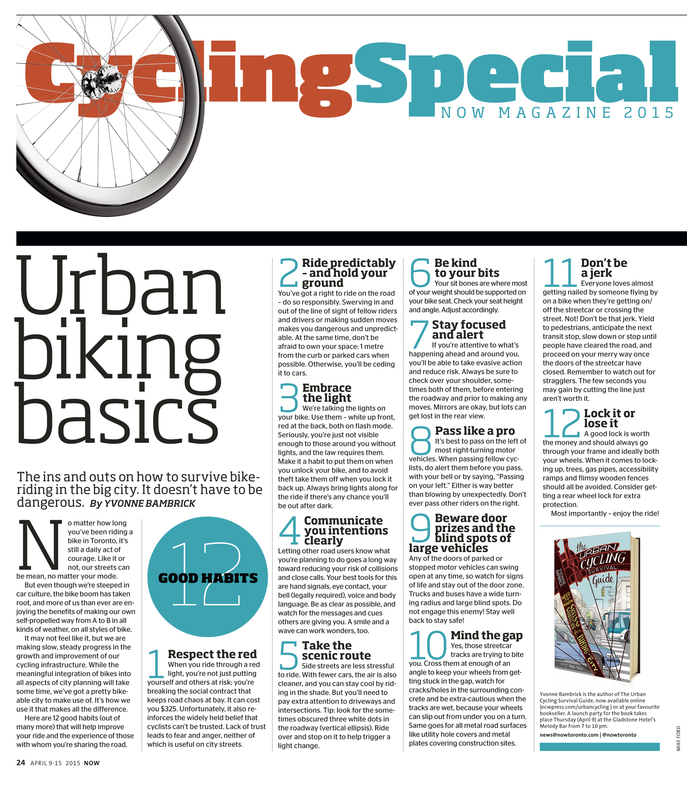 Lots more in my book, The Urban Cycling Survival Guide. Fall is a gorgeous time to ride the trails! Watch for mud and fallen branches. My book made the Canadian best-sellers list! 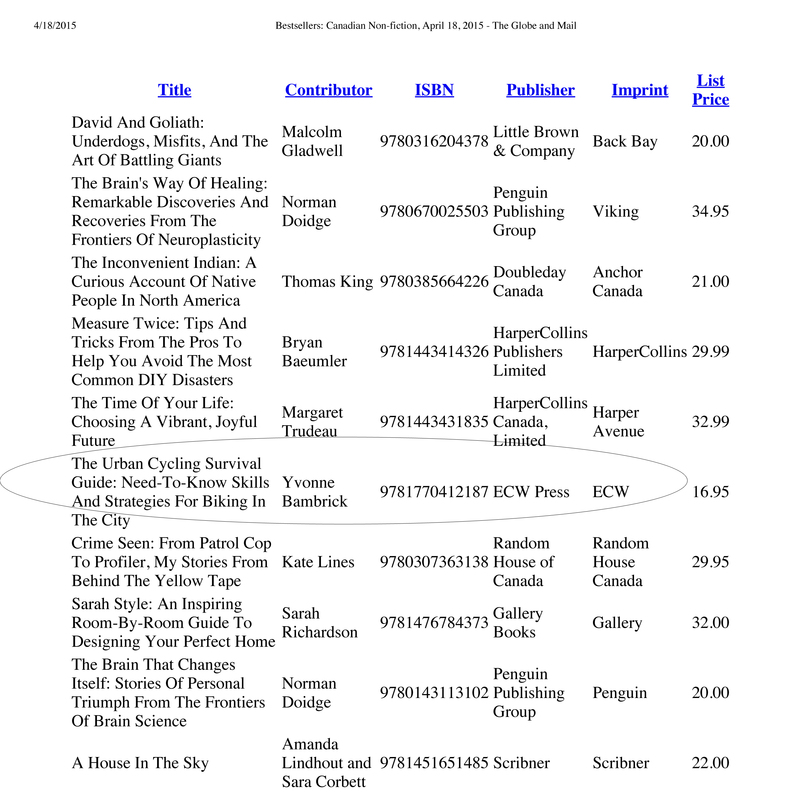 I just about choked on my spritzer last Friday evening when I found out that The Urban Cycling Survival Guide had debuted at #6 on the Canadian non-fiction best-sellers list, and at #7 on the regular non-fiction list in The Globe and Mail, and Toronto Star. Took me a while to fully take in the fact that I was officially a ‘best-selling’ author. And while it may not last, it happened. Let’s just take a moment to consider the awesomeness of a book about urban cycling making it onto this list… A-mazing – sign of the times! Obviously I’m thrilled – people are picking up the book and I’m achieving my goal of sharing this information. Ride on, ride on! 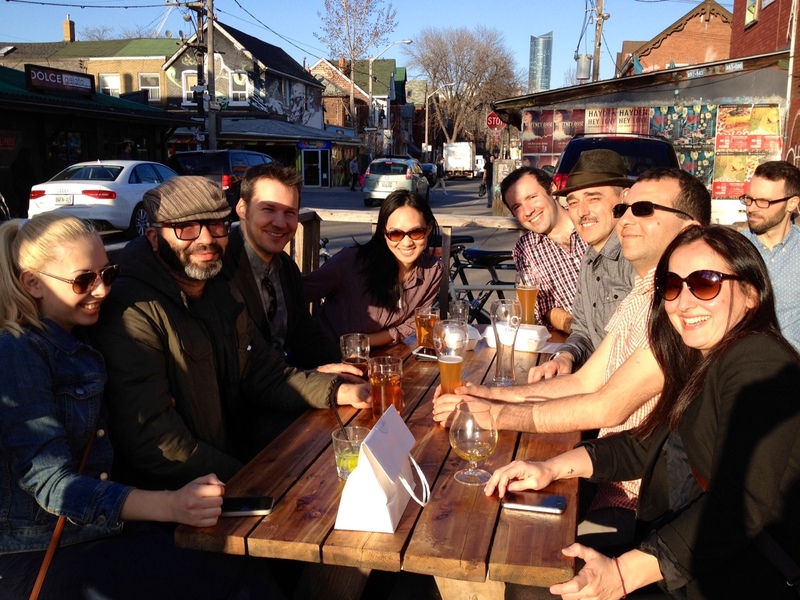 Raising a toast with friends at my local in Kensington Market! Comments Comments Off on My book made the Canadian best-sellers list! 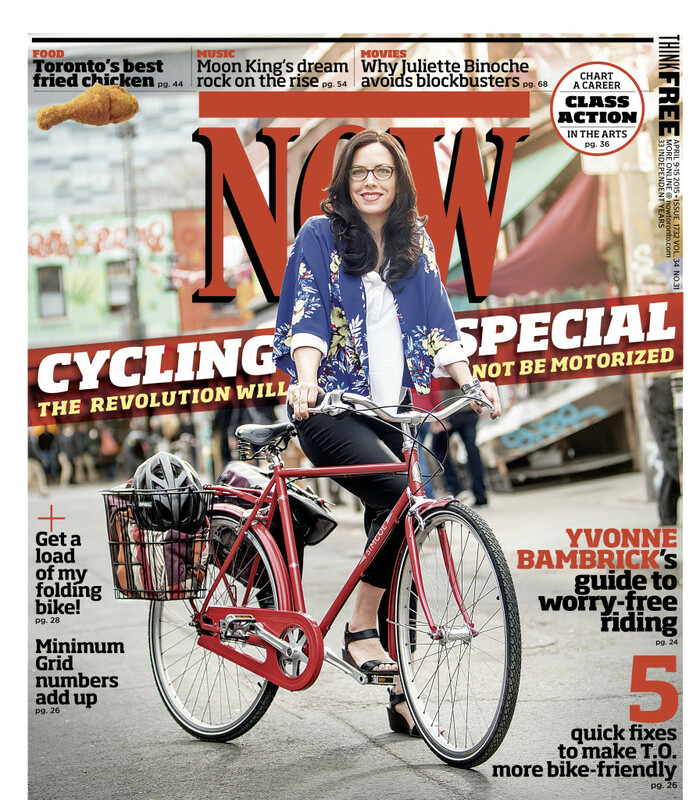 What an honour to make the cover of NOW Toronto! Wow! 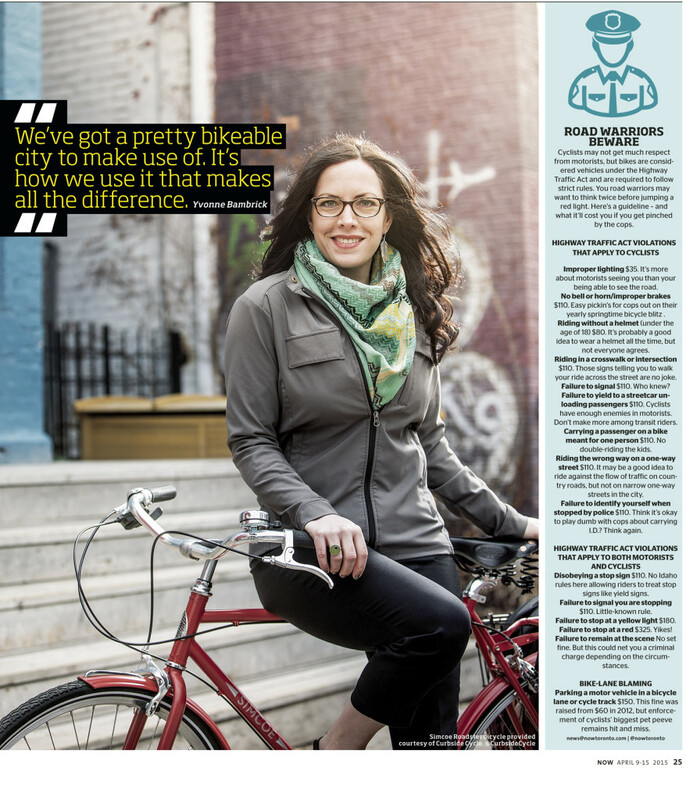 So as a born and bred Torontonian, and someone who has grown up flipping through NOW magazine, our free weekly ‘what’s happening in the city’ paper, I’m feeling pretty excited and honoured to be on the cover of the 2015 Cycling Special!! 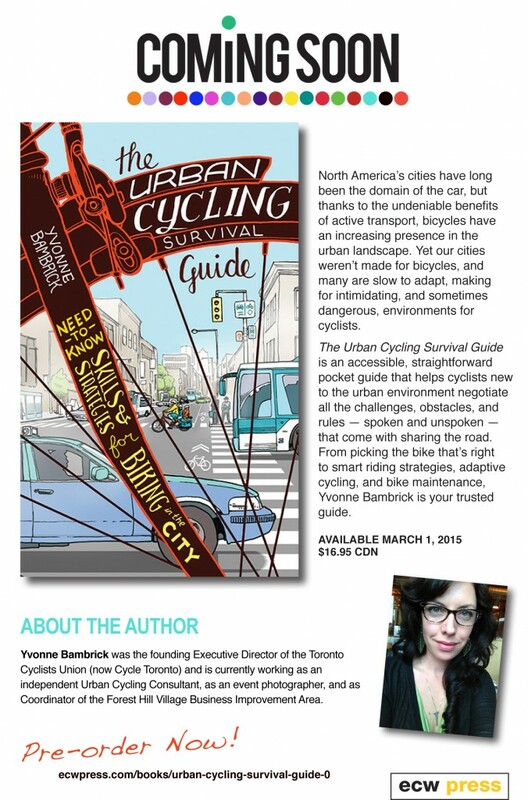 While it is a bit surreal seeing your face all over town for a week, I’m thrilled about the exposure this is providing for my new book The Urban Cycling Survival Guide which hit stores across Canada and the US on March 1st, 2015. I wrote this book because I wanted to get it into peoples hands and this coverage is going to be a big help. Almost anyone can ride a bike to get around town – you don’t need special clothes or gear, but you do need to understand how to be part of traffic on two wheels instead of four. My book shares all the information you need to get rolling. Comments Comments Off on What an honour to make the cover of NOW Toronto! A dozen habits to adopt for surviving and thriving on a bike in the city. When you ride through a red light you break the social contract that keeps road chaos at bay. Doing so not only puts you and others at risk, unfortunately it also reinforces the widely held belief that cyclists can’t be trusted. Lack of trust leads to fear and anger – neither of these is useful on city streets. You’ve got a right to ride on the road – do so responsibly by riding in a straight and predictable line. Swerving in and out of the line of sight of fellow riders and drivers, or making sudden moves, makes you seem unpredictable. 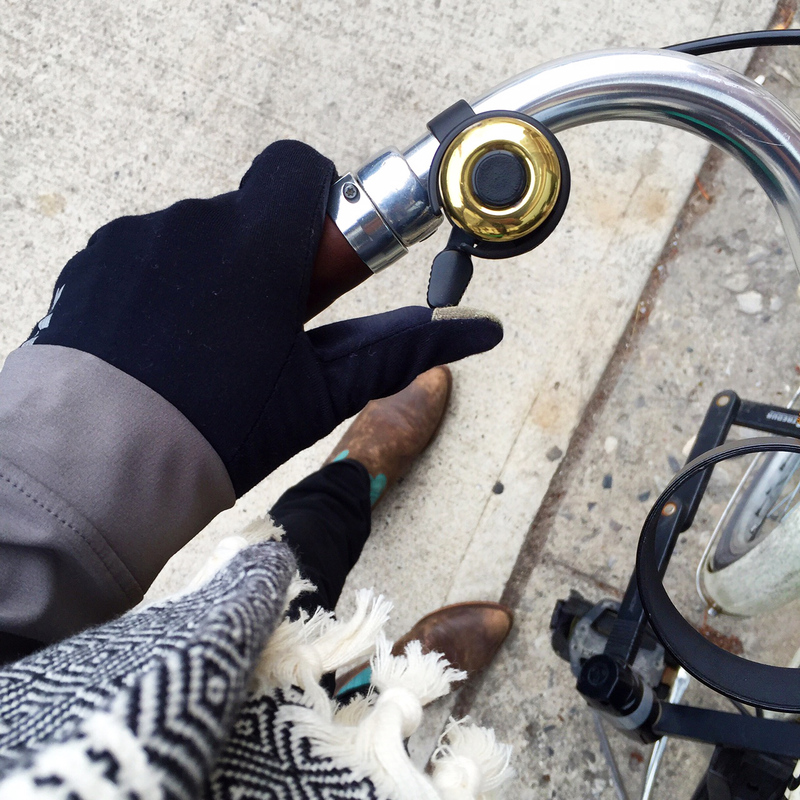 Hold your line and don’t be afraid to own your space – aim to ride 1m from the curb or parked cars when possible. Use them — white up front, red at the back, both on flash mode. Seriously, you’re just not visible enough to those around you without lights, and the law requires them. 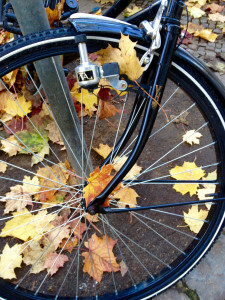 Make it a habit to put them on when you unlock your bike, and to avoid theft take them off when you lock it back up. Always bring lights along for the ride if there’s any chance you’ll be out after dark. Letting other road users know what you’re planning to do goes a long way to reducing your risk of collisions or close calls. Your best tools for this are hand signals, eye contact, your bell (legally required), voice, and body language. Be as clear as possible, and watch for the messages and cues others are sharing with you. Side streets are generally less stressful and more enjoyable to ride on than main streets. With fewer cars, the air is also cleaner and you can stay cool by riding in the shade. Pay extra attention to driveways and intersections, and look for the sometimes obscured 3 white dots in the roadway (vertical ellipsis) – ride over and stop on it to help trigger a light change with your bike. Your lock (a good one is worth the money) should always go through your frame and ideally both your wheels. Trees, gas pipes, accessible ramps, and flimsy wooden fences should all be avoided. Consider getting a rear wheel lock for extra protection. Your sit bones, not your bits, are where most of your weight should be supported by your bike seat. Check your seat height and angle – adjust accordingly. If you’re attentive to what’s happening ahead and around you, you’ll be able to take evasive action and reduce risk. Shoulder check before entering the roadway and prior to making any moves. Pass to the left of most right-turning motor vehicles. Alerting other riders before you pass, either with your bell, or by saying ‘passing on your left’, is better than passing unexpectedly – never pass other riders on the right. Any of the doors of parked and stopped motor vehicles can swing open at any time so watch for signs of life and stay out of the doorzone. Trucks and buses have a wide turning radius and large blindspots – do not engage this enemy, stay back to stay safe! Yes, those streetcar tracks are trying to bite you. Cross them at enough of an angle that your wheels won’t get stuck in the gap, watch for cracks/holes in surrounding concrete, and be extra cautious when they’re wet because your wheels can slip out from under you on a turn. 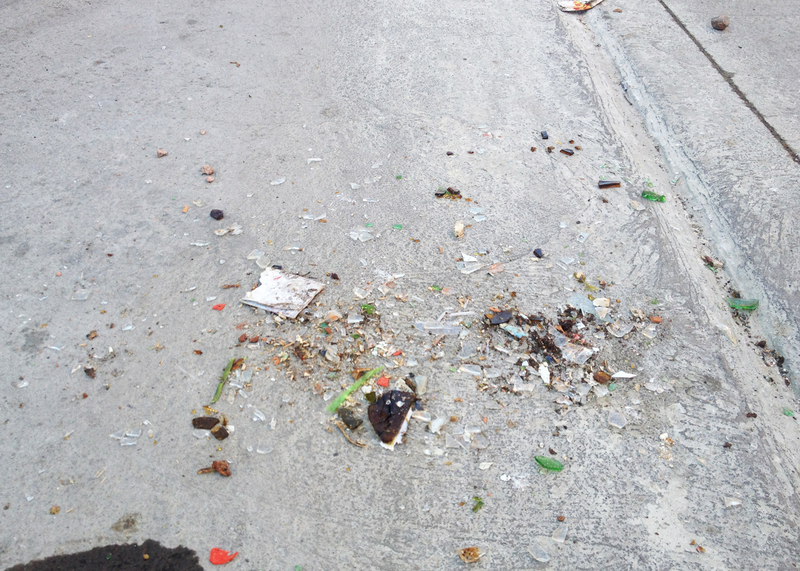 Same goes with all metal road surfaces like utility hole covers and metal plates covering construction sites. 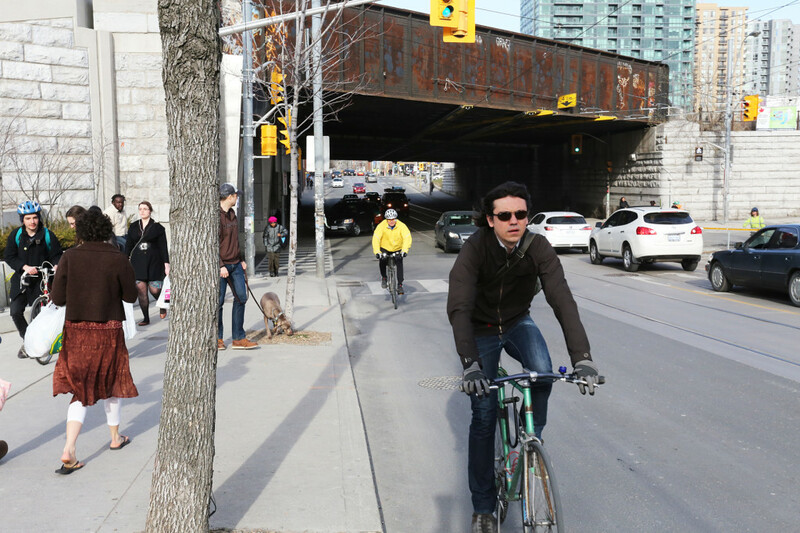 Everyone loves almost being nailed by someone flying by on a bike when they’re getting on/off the streetcar, or crossing the street – not! Don’t be that jerk. Yield to pedestrians, anticipate the next transit stop, slow down or stop until people have cleared the road, and proceed on your merry way once the doors of the streetcar have closed. Remember to watch out for the stragglers. Comments Comments Off on A dozen habits to adopt for surviving and thriving on a bike in the city. 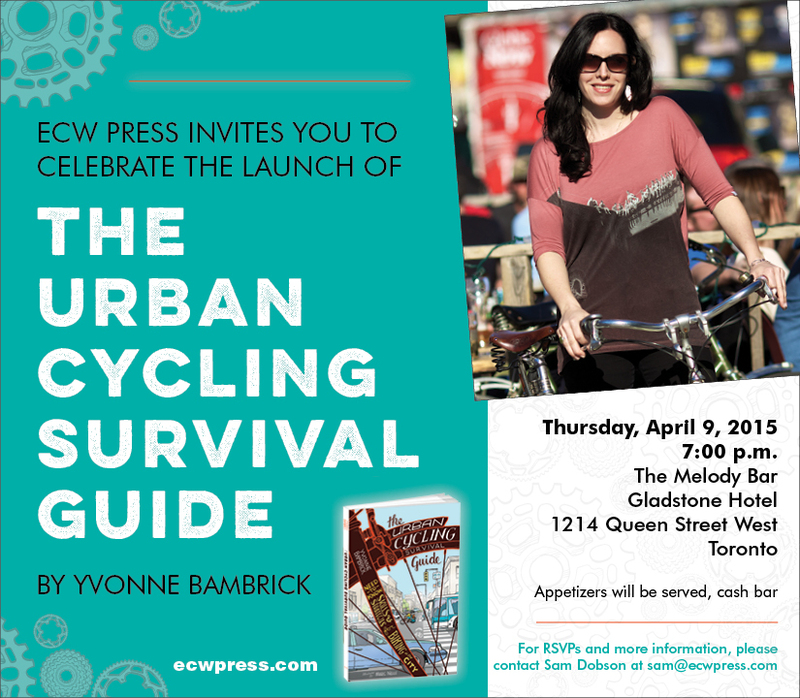 Urban Cycling Survival Guide Launch Party! So, the book will be available in stores as of March 1st, but the party to celebrate isn’t until April 9th. Can’t wait to celebrate with friends and colleagues! Comments Comments Off on Urban Cycling Survival Guide Launch Party! In late September 2012, it finally occurred to me that I too often referred to the ‘gap in cycling education’ as an issue of concern in the urban mobility dialogue. In that moment I decided it was time for action instead of talk – I was going to try and help fill that gap. The book idea began as one focused on the province of Ontario, quickly shifted to addressing cycling across Canada, and within a few months of discussion and reflection landed firmly and finally as a book that would address how to cycle in cities across North America. By October 2013 I had found the right publisher, signed a contract with ECW Press, and officially begun my journey as a writer. In the early days of this project, when I was still in disbelief that I’d actually signed myself up to take on something of this scale, a dear friend gave me a postcard with this quote on it. We gain strength, and courage, and confidence by each experience in which we really stop to look fear in the face… we must do that which we think we cannot. Eleanor Roosevelt. Having glanced countless times at these words posted by my desk, I can now fully appreciate their truth. After months of writing, researching, interviewing, editing, re-writing, and more editing, I’m thrilled to say that the book is now a reality and available for pre-order in advance of the Spring (March) 2015 launch. Beautifully illustrated by Marc Ngui, it also includes some of my photographs. Early feedback has been very positive and I can hardly wait to see it in people’s hands. In the meantime, I compiled an excerpt for the Cities for People series on Spacing – check out Adding a bike to your urban mobility toolkit . I occasionally like to post articles in which I’m quoted. I’ve highlighted my quotes in bold. 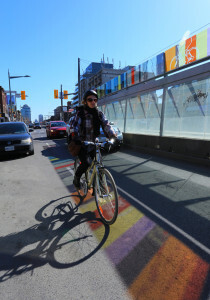 Spring, maybe, is coming to Toronto, ensuring a resurgence of cyclists and a fresh round of discussions on effective road-sharing strategies. 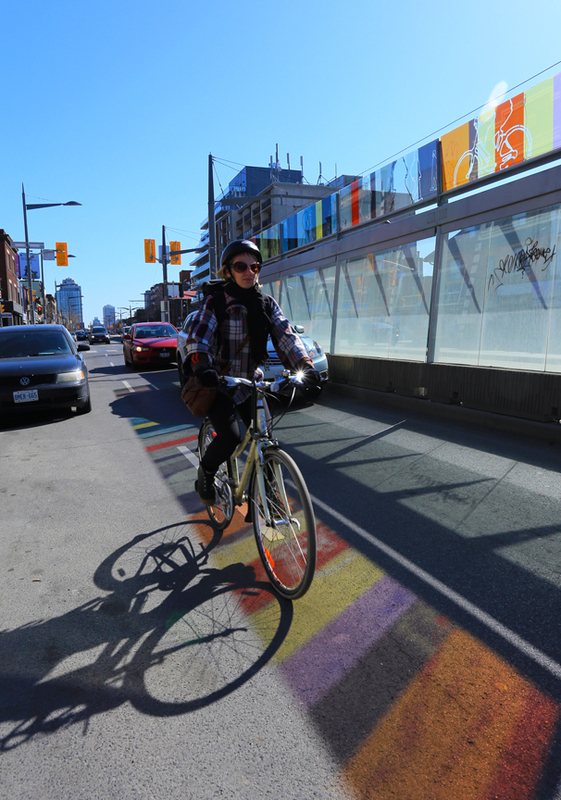 The annual Ontario Bike Summit will be held in Toronto on April 14-15, with an agenda that includes a discussion on how to create bicycle-friendly communities. Meanwhile, a new report from the Ontario Professional Planners Institute calls for the inclusion of “active transportation,” such as cycling and walking, as a building block of healthy, sustainable communities. The report, a follow-up to a 2012 study “Healthy Communities and Planning for Active Transportation,” says that many Ontario municipalities are in the process of establishing policies and practices to include cycling, walking and related activities as part of their regulatory frameworks. “Further progress is needed, however, as few communities have implemented these policies in the development of their transportation network,” the report states. Long-time Toronto cycling advocate Yvonne Bambrick says that, even with city bike plan in place, increased efforts are needed to promote road-sharing knowledge by drivers, pedestrians and cyclists. “What we need is public education,” she told NRU “Bikes belong on streets, and we need to look at how bikes are to interact [with others using the road].” She says those norms will be best set by public education campaigns, which she argues have been neglected in the last five years. The OPPI report says planners have a role to play in implementing the province’s Cycling Strategy, developed in response to a 2012 review by the Office of the Chief Coroner that cited 129 cyclist deaths between 2006 and 2010 and 95 pedestrian deaths in 2010. The coroner’s office concluded that “100 per cent of [pedestrian and cyclist] deaths were preventable,” according to OPPI. In a press release on the OPPI report, association president Paul Stagl stated he is impressed with examples where healthy community best practices are included in official plan policies, subdivision design and site plan approvals. Echoing OPPI’s message for all communities to address active transportation in their plans, Bambrick says cycling infrastructure needs to be developed for inner suburbs in Toronto, not just for downtown residents. “We shouldn’t just be focusing our attention on the core,” she tells NRU, suggesting there is room for bike lanes on arterial roads. “We’re still well behind schedule [in the suburbs].” “Just because people don’t live in the downtown core doesn’t mean they don’t want to use their bikes,” she says. Rivers of bicycles, oh my! Tips for the Spring bicycle deluge. The seasonal flood of bicycles is as sure a sign of Spring as tree buds, litter piles, and tulips. As with most things in life, this is heaven to some, and hell to others. Below are just a few thoughts, cautions, and insights for both drivers and riders as the ‘bike season’ gets underway. Riders: If at all possible, take your first ride of the season on the weekend, or after work/school, when you’re not in a rush. Along with these other Spring tips, dust off the cobwebs, pump up those tires, test your brakes & lights, give your chain a little lube, and take her for a spin. You’ll be better able to enjoy your re-found freedom, and have the time to stop in at the local bike shop to solve any mechanical problems. Riders: Yes, it really does feel amazing to ride a bike again for the first time since whenever. It’s easy to get distracted and caught up in feeling like you’re flying, but you must remember that traffic is still traffic and you’re part of it when riding your bike. Go ahead, enjoy the wind in your hair and the sun on your face, but stay focused on the task at hand; riding predictably, as part of traffic, to arrive safely at your destination. Save the joyrides for weekends and summer nights, not for the morning or evening commute. Drivers: Please be patient. Many of the people riding along beside, in front, and behind you have either been cramped up in public transit vehicles, alone in cars, or car-pooling for the past 6months and they’re feeling exhilarated to be back out in the world moving around on their own terms. Just as you’ve got to get used to sharing the road with more bikes again, they’ve got to get back into the rhythm of the ride and sharing the road with you. Remember, bicycles are considered vehicles under the law and have as much right to use the roads as motor vehicles. And cycling is fun, maybe this is the year you’ll give it a try? Riders: You also share most of the same responsibilities as drivers for following the rules of the road. Signaling your intentions, obeying signs and signals, riding predictably and with courtesy for other road users, using lights on your bike at night, and giving right of way to drivers/riders/pedestrians as appropriate, are all very important. These matter not just for your safety, but also (like it or not) for how bikes are perceived as part of traffic, and treated in turn. City streets might seem fixed – they’re anything but. Many seasonal changes are a given – poor road conditions, wider variety of road users, attitudes, construction zones… and in the same way we adjust our wardrobe, changes to our driving/transportation habits and behaviours are a part of this seasonal shift. Spring roads are usually in bad shape. This winter has been one of the roughest yet for most of North America, and our roads have taken a beating. Bicycles and their riders are much more susceptible to harm from uneven surfaces, wheel eating potholes, slippery gravel and debris. Riders: Take it easy on your first few rides to and from your usual destinations. You’ll need to learn, hopefully not the hard way, where the rough spots are along the way. Some potholes are so wide for example that you’ll need to plan ahead and change lane position in advance so that you can get around them. Some parts of the roadway may have heaved because of the freeze thaw cycle, and there is a lot more gravel, glass and other debris in the road at this time of year. As always, pay close attention to everything happening around you on the roads/sidewalks, slow down and/or stop as needed/instructed, avoid squeezing between vehicles, pass to the left of a right turning vehicle, and stay back from trucks and buses. Sure, we’re all important people hurrying to get to important places, but nothing is more important than getting there in one piece, and without causing harm/stress to our neighbours. The key thing to remember is that we’re all in this together and safely sharing the roadways is a shared responsibility. Whether on foot, by bike, or in a car, do yourself and everyone around you a favour by packing your patience when heading out onto the streets of your city. Regardless of the season, courtesy is always in style. A great start to 2014! On January 1st, 2014, I had the honour of appearing as ‘Photo of the Day: Bambrick‘ on local cycling website Biking Toronto. The photo, taken on a hot summer day last June, was captured by fellow cycling advocate and photographer, Xander Labayen. He managed to catch me through a streetcar window while riding along Queen St. West (you can see his checkered shirt reflected in the window.) He also managed to catch me just as I was catching my skirt and pulling it back down – so it’s a saucy photo at that! Given the super chilly start to the year, this ‘hot’ photo from summer is a nice reminder of what’s now only a few months away. It’s also a fun way to kick off what I hope will be an excellent year ahead. Comments Comments Off on A great start to 2014! Cycling workshops – Bike Month 2013! Join me for one of my city cycling workshops during Bike Month 2013! To register, please email yvonne@yvonnebambrick.com and include session date of interest. Feel free to give me a call at 416 826 2964 for further information. 215 Spadina Ave., Suite 400, Alterna Boardroom. Bring your midday snack and chew on a bunch of tasty need-to-know urban cycling info at this lunchtime session. Perfect for newer cyclists, but something for everyone! Comments Comments Off on Cycling workshops – Bike Month 2013!